Many charities rely on signature annual events to financially support their mission-driven work. A common activity at these events is a live and/or silent auction in which the charity solicits donations from individuals and businesses. 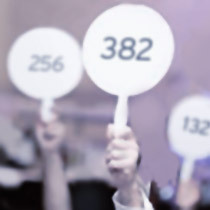 While auctions can provide meaningful financial support, they also create certain compliance challenges for charities, their donors, and the individuals who purchase auctioned items. There are many considerations that charities and their donors should keep in mind when participating in auctions. Which donations get a charitable deduction? Cash is the most straightforward example of a donation that is eligible for a charitable deduction. An example is a “paddle raise” at an auction. Assuming the donor receives nothing in return, the donor should be able to take a charitable deduction for the entire amount of their donation. Physical items contributed to an auction are also eligible for a deduction. Generally speaking, donors can only deduct their cost basis in the tangible property they donate to the auction. For instance, if a store donates an item from its inventory, the store can take its cost basis in the item as a charitable deduction. Similarly, if a generous supporter donates a case of wine from her personal wine cellar, she may take a deduction for her cost basis in the case. Services are typically not eligible for a charitable deduction. If the donor is an individual or business that offers services (such as a photography session, massage, or tutoring), the donor is not permitted to take a charitable deduction for the value of those services. Art donations are the most complicated types of donations. The size of a charitable deduction resulting from an art donation depends on whether the art is considered income or capital gain property and how the art will be used. If donating a piece of art to an auction, a donor can only deduct the cost basis of the art (i.e. what the donor paid for the art or, if the donor is also the artist, the cost to produce the art). Art cannot be deducted at fair market value unless it is being donated to a charity, like an art museum, that will keep the art in direct furtherance of its mission and the donor has owned the art for at least one year. What does a purchaser get to deduct, if anything? Purchasers of items only get to take a deduction if they pay more than the item’s fair market value. If the purchaser pays more than the item’s value, the purchaser can deduct the difference between the item’s value and the amount paid. A purchaser must be able to show that he or she knew the value of the item in order to deduct any overage. Example: A painting is donated by the artist. It cost the artist $50 in supplies but would normally sell for $1,000. The fair market value that should be listed is $1,000. If a purchaser pays $1,250 for the item at a charity auction, $250 of their purchase is tax-deductible. The artist can only deduct $50 as that was their cost for production. Because knowing the correct fair market value is critical in knowing how much, if any, of a purchase is deductible, charities should require donors of items to provide the fair market value of the items, not the amount the amount they will personally be able to deduct. Often times the value of a donated item is easily ascertained, and in such cases the charity can rely on that as evidence of the fair market value. In many situations, though, a fair market value may not be so easily established such as with donated art, collectible items, jewelry, or vehicles. The charity should seek a qualified appraisal before listing an item’s value whenever the fair market value of an item is not certain. If the donor believes the item is worth $5,000 or more, and the donor intends to take a charitable deduction, an appraisal is required by the IRS unless the item is being donated is inventory or held for sale by a business (i.e. a car donated from a dealership would not need an appraisal but one donated by an individual would require one). The charity should rely on a qualified appraisal provided by the donor. A qualified appraisal must be performed by someone who is knowledgeable about the field, has the credentials of an appraiser in the given field, regularly prepares appraisals, and is willing to make a declaration that, based on their background, experience, education, and membership in professional associations, they are qualified to make appraisals of the type of property being valued. Art often requires an appraisal. An appraisal of a piece of art has to include certain items, outlined by the IRS in Publication 561, which include the piece’s size, subject matter, artist, medium, its cost, date of acquisition, the piece’s history, and the facts upon which the appraisal was based, including analyses of sales of similar items. If the piece of art is valued at more than $20,000, the donor must attach a complete copy of the signed appraisal to his or her tax return for the year in which the deduction is taken. If the piece of art is valued at $50,000 or more, the donor can request a Statement of Value from the IRS prior to filing the tax return that reports the donation. Following a charity auction, the charity should provide receipts to donors and purchasers. Charities should suggest that the donor/purchaser seek the counsel of their own tax preparers for specific questions regarding deductibility. To donors of cash or items, receipts should describe the donations and state whether any goods or services were provided in return for the donation (if the charity provided something in exchange it may limit deductibility). To purchasers, the charity should provide a receipt describing the amount paid and whether the amount exceeded the fair market value of the items, and if so, by how much. What forms must be filed in connection with a charity’s receipt of donated goods to be auctioned? In addition to its standard bookkeeping obligations related to documenting donations, revenue, and expenses, a charity must complete Form 8282 covering charitable deduction items sold at the auction that’s value exceeded $5,000. The charity then submits the form with its annual tax filing. The charity does not need to report any items which were not eligible for a charitable deduction, such as donations of services or vacation home stays. The $5,000 threshold of Form 8282 only applies to the value of the item, not what a purchaser eventually paid for the item. The charity must also provide a copy of Form 8282 to the original donor. Anyone who donates an item worth more than $500 and less than $5,000 is required to file Form 8283 with their annual tax filing. This requirement applies to both businesses and individuals. In order to complete the form, the donor must know his or her basis in the property and the property’s fair market value. The charity which received the item must acknowledge receipt of the donation on Part IV of Form 8283. Engaging your supporters locally and harnessing grassroots social networks can be a powerful driver of awareness and source of funds for social good, all of which can be accomplished by an effective charity auction. Careful planning is required for success and a knowledgeable attorney or tax professional can help your organization navigate the many compliance issues that accompany a charity auction. Note that, pursuant to Treasury Regulations under section 170, if a donor contributes tangible property that is put to an unrelated use (e.g., the property is donated for the purpose of being auctioned off for fundraising purposes), the donor’s charitable deduction is limited to his or her tax basis in the donated property. I am chairing a benefit art auction for the 2nd year. Last year we sold 50% of the artwork presented and we just got an email from on of the buyers that they need their tax letter. We believe that there is no tax-deductible part of their purchase. For example, an artwork with retail price of $1000 was sold at $600. The artist gets 40% of retail price and our fundraiser gets the other $200. Does the art buyer get any type of tax deduction on the artwork they bought? I think no because they bought below the retail price. Can you please verify? I have a question for you though. How do you record the donation of the artwork if the donor is receiving 40% of the proceeds? We will have an event and some of our artist will receive a percentage of the purchase price and our organization will receive the remaining proceeds. You’re absolutely correct that your acknowledgment letter needs to include a disclosure of the value of any goods or services received in exchange for the contribution. With regards to artwork where the artist is receiving compensation, just make sure you’re separating the two issues. On the one hand, you have the artist – if they’re receiving compensation, make sure you document that compensation. Don’t issue them a letter thanking them for a donation of artwork without noting what they received in return. On the other hand, you have the donor who purchases the artwork at the auction. For that donor, whether or not the artist receives compensation makes no difference – they still need a letter noting what they paid and whether they received anything of value in return. Feel free to reach out via email (jeremy@nullperlmanandperlman.com) with any follow up. We had a situation in which a donor donated the use of a vacation condominium and it was sold at a silent auction fundraiser for $1,800. The owner of the condominium sold the property shortly thereafter making it unavailable to the people who bought the use of it at the auction. The people who bought the use of the condominium wanted their money back, but several members of the board wanted to keep the money and an attorney claimed that the money could not be returned. It seems to me that the board has a responsibility to return the $1,800.